ESA has published new photos of the region on planet Mars called Nili Fossae taken by its Mars Express space probe’s High Resolution Stereo Camera (HRSC). The Nili Fossae are a group of tectonic depressions called graben that show signs not only of geological activity but also of erosion by winds and especially by water that dug the shapes still visible today. Part of the Syrtis Major quadrangle, the Nili Fossae are close to the plain called Isidis Planitia, a huge basin created by an impact that ejected a huge amount of materials some of which ended up in Nili Fossae’s graben. Other materials present in the graben, whose traces are visible thanks to the darker color, are made up of volcanic sand. All this increased that region’s geological complexity, also characterized by an amount of different minerals that include some iron’s and aluminum’s. The result of so many different events is a region full of rocky valleys, hills and mesas, as uplifted rock surfaces generated by erosion, with the result that they have flat top and steep walls, are called in jargon. The study of erosion is important to understand the action of water that took place in ancient times, when Mars was young and much more similar to the Earth. The Mars Express space probe’s OMEGA (Observatoire pour la Minéralogie, Eau, les Glaces et l’Activité) spectrometer contributed to that research by detecting the presence of clay minerals that can only be formed in the presence of liquid water. The action of water also caused the differences in elevation among various areas of the Nili Fossae. The areas on the left side of the top image, which represents the southern area, are mainly made up of plateaus and therefore are higher than those on the right side of the image, which represents the northern area. According to the researchers, hundreds of millions of years ago, water and ice transported materials from the higher areas downwards, contributing to the erosion of the region. In recent years, the Nili Fossae have already been the focus of interesting research. For example, in 2009 traces of methane emissions whose origin is not clear were found. The carbonates present in the region have been studied several times and in 2010 a team of researchers suggested that they were the product of an ancient hydrothermal activity. All of that is interesting also because methane can be produced by biological processes and hydrothermal sources could have been the nursery of life on Earth. There’s no certainty and on the contrary there are many doubts but it’s clear that researches of this type always take into consideration that hypothesis even if it’s not possible to provide a definitive answer. Many regions of Mars show signs of more or less ancient activity and for this reason they get studied by the various space probes in orbit and by rovers on the surface. The Nili Fossae show many of those signs and contain more minerals than most of the other regions, that’s why they represent an excellent object for studies on the red planet. 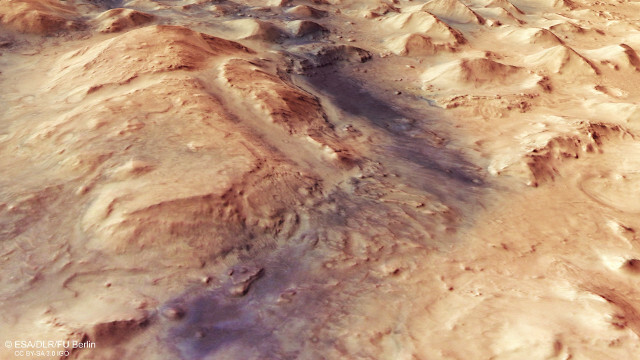 Niki Fossae on Mars shows sign of future evolution. Probably it’s all dead in the area but even if there was something alive the environment doesn’t seem very dynamic.